Bride & Groom will be taken from the airport with a limousine, will be brought to the Hotel. Photographer will take pictures of the couple during the way from the airport to the hotel. This photo shoots will be used in the wedding story clip. Welcome cocktail at arrival to the hotel.At Hotel entrance ancient Ottoman military band show with live music. A Special gazebo will be prepared for the bride and groom. Gazebo will be adorned with chiffon and tulles in colors of bride & groom's wear.2 special seats in Indian style will be prepared for bride and groom. The ground will be covered with carpets and floor cushions. For the entrance of the Mehendi ceremony venu special garden door will be set up and will decorated by fresh flowers. Right and the left sides of the door, two wooden stairs will be set and decorate by flowers and lanters. 6 high metal stands with flower arrangements will be placed on bridal walkway. Stands will be adorned with fresh flowers and colourful tulles. A special bridal table will be prepared. Colourful runners will be laid on the table. Table will be decorated with accessories and fresh flowers. Underplates will be placed on table. Bowties of satin ribbons will be used as napkin bracelets. Candleholders and candles with Swarovski crystals will be used for decorations. Chairs will be decorated with fresh flowers and tulles. Round tables will be prepared for guests. Tables and Tiffany chairs will be adorned with satin and colourful chiffon. Colourful runners and underplates will be placed on tables. Fresh flower arrangements will be placed to small logs on tables. Tables will be adorned with special flower decor. Bowties of colourful satin ribbons will be used as napkin bracelets. Sound System, DJ mixer, microphone and a professional DJ (Indian music). You can bring CD with Indian music you’d like to be played with yourself. Indian henna will be applied to the hands and feet of the bride. The Mehndi ceremony will be recorded in full HD quality by 2 professional videographers and drone. 3 english speakers wedding consultant Managers to care with guests. Flower arrangements and the decoration of the venue done by a professional staff. Bar tables will be prepared at the fpyer area. They will be adorned with colourful fabrics. Fresh flower arrangements will be placed on tables. Chips, buts,crudites and alcoholic - non alcoholic drinks will be offered for guests. Live acoustic music - violin, classic guitar, accordion. 8 glass flowerpots with fresh flowers will be placed on the entrance and decorated with tulle bowites in decoration colours. Colourful LED lights will be set up between flowers. 10 volcano fireworks will be placed between flowerpots. Red carpets with rose petals will be rolled on the floor. The venue will be prepared for Sangeet ceremony. Special Bridal table will be set up on the stage. Board will be prepared behind of table with colorful Chiffon drapes. Colorful projectors will light up the stage. The Bridal table will be prepared special in colours of couple's dresses. Runners will be laid on it. Table will be decorated with flowers and other accessories. Swarovski stoned under plates will be set up, the napkins will be tied with Swarovski stoned napkins bracelet. Swarovski stoned candles and candle holders also will be set up. Round tables and chairs will be decorated in the main colour of the bride and groom's dresses (or with chosen colours). Tables will be decorated with satins and chiffons. Runners will be rolled on tables. Glass vases decorated with local seasonal fresh flowers, will be placed on the tables. Under plates and napkin bracelets will be used. Beautiful Candles will be set up. Golden colured Tiffany chairs will be decorated with vibrant coloured tulles. Chairs will be decorated with the flowers in same colour with the decoration. Professıonal DJ (Indian music). You can bring CD with Indian music you’d like to be played with yourself. 3english speaker wedding consultant Managers to care with guests. Professional full HD video recording by 2 professional videographers. A suitable venue will be prepared at the hall for Mehndi Ceremony. Rugs and mattresses will be placed on the floor. (We recommend you to bring your traditional accessoires for the ceremony). Wedding Ceremony will start after the lunch. Groom will come to the wedding venue with white horse, accompanied by friends family. Aerial video and photo shooting by drone. Traditional religious ceremony: Big platform at the green area will be prepared and will be decorated with fabrics and fresh tagetes flowers.2 seats will be placed for bride & groom. The venue will be decorated with seasonal local fresh flowers. Chair layout will be prepared for guests to sit during the ceremony and will be decorated with colourful fabrics. Bistro tables will be prepared and will be decorated with fabrics for guests who will watch the ceremony by standing. Vases with fresh flowers will be placed on tables. An Altar will be set up on the entrance and will be decorated with fresh flowers and colourful tulles. 6 gold coloured decorative columns with fresh flowers will be placed on bridal walkway. White carpet with red rose petals will be rolled on the ground. two white doves will be released by the couple as a symbol for luck. Professional DJ, Sound system, DJ setup and microphone will be set up. A special bridal table will be prepared on stage on platform for bride & groom. 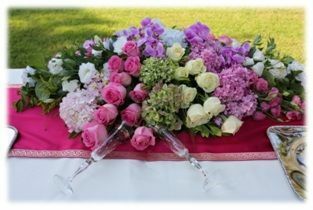 Decoration will be prepared in the fund behind the table with fabrics in many colour tones and will be decorated with fresh flowers. Bridal table will be prepared with main colour of the couple’s dresses. Runners will be placed onto table. Glass accessories with colorful flowers will be placed on table corners. Mirror in Buta motif with Swarovski crystals will be set up on table. Candles in candleholders with Swarovski stones will be placed on those mirrors. Underplates with Swarovski crystals will be used. 2 Small different size vases will be placed on the table. And decorated by pearls and Vases will be filled with water and transparent stones and floating candles will be placed in the vases.table will be decorated with Swarovski stones candlesticks and candles. Round tables and Tiffany wood chairs will be decorated organza in colours of decorations (or any choosen colours) The tables and chairs will be adorned with satin and Chiffon. Runners will be rolled on tables. Long Martini glasses, decorated with seasonal fresh flowers, will be placed on the tables. 2 Small different size vases will be placed on tables. Pearls will be put to the vases with colourful ribbon. Vases will be filled with water and transparent stones and floating candles will be placed in the vases. Mirror underplates will be placed on tables. Bowties of satin ribbons will be used as napkin bracelets. Tables will be adorned with candles. Special designed 5-layer wedding cake- it will be decorated with imitation flowers and satin bow ties + 20 volcano fireworks show. At the final of the wedding bride will throw her bouquet to bridesmaids and groom will throw bride's gartier to groomsmen. Special designed Bridal bouquet and the groom’s collar flower ( A wristband will be prepared for bridesmaid’s wrist in same color with bridal bouquet. Boutonnieres similar with bridal bouquet will be prepare for groomsmen) . Special garter with Swarovski stones for bride. Also gartiers at the same color will be prepared for bridesmaids. 3 professional photographer takes 2000 to 2500 pictures in JPEG format. Professional video recording with Jimmy Jip and actual shoulder camera by 2 videographers. (A Wedding Story will be prepared. Original videos and photos taken during all ceremonies will be given in the hard disk. English speaking member of our Team (wedding consultant) will assist the couple during the day. 3 english speaker wedding consultant Managers to care with guests. A special marriage certificate and a wish bottle will be given by our Team as a gift. At the wedding day the hotel room will be decorated with tulle and fresh flowers according to the meaning of the day. Cookies, chocolate and Turkish delight will be prepared at the room. Ice Creams Station, Assorted Icecream, Fruit Sauce, Caramel Sauce, Chocolate Sauce, Chopped Nuts.